Logging data to an SD card. Reading and processing data from an SD card. Reading uLisp programs from an SD card and adding them to the current workspace. For examples of these applications see Applications below. The SD card interface allows you to have one file open for reading and one for writing, so you can process data from one file to another. A compile option sdcardsupport at the start of the uLisp source, disabled by default, allows you to choose whether to include SD card support in uLisp. Including it slightly reduces the amount of workspace available for uLisp programs. The SD card interface is not currently supported on the MSP430 boards. Evaluates the forms with stream bound to an sd-stream reading from or writing to the file filename. The filename should be a string of up to 12 characters, consisting of a filename of up to 8 characters, a dot, and an extension of up to three characters. If the file already exists Append writes to the end of the file without affecting the existing contents, whereas Overwrite deletes any existing content first. The functions print, prin1, princ, terpri, pprint, write-byte, write-string, and write-line can all be used to write to an SD card. The functions read, read-byte, and read-line can all be used to read from an SD card. If the end of the file has been reached, each of these functions returns nil. Unfortunately SD cards are not supported on the Arduino Uno because the standard Arduino SD card library makes uLisp too large to fit in the 32 Kbytes available on an Arduino Uno. 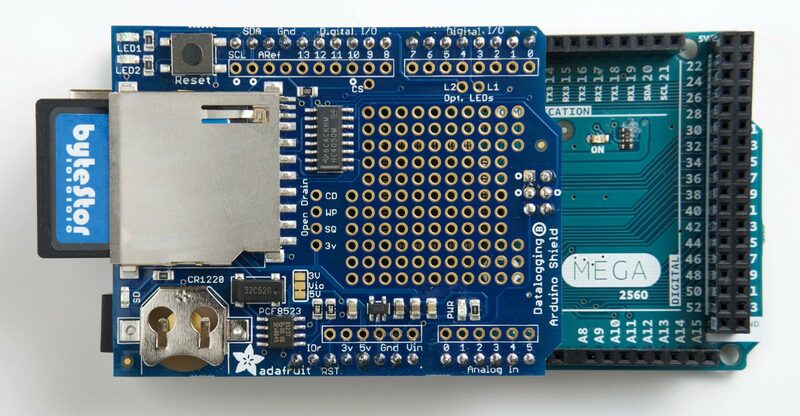 The SD card support works nicely on an Arduino Due with a suitable SD card shield, such as the Adafruit Datalogging Shield . For example, you could use this program in conjunction with an TMP35/TMP36/TMP37 temperature sensor to log temperatures. ^ Adafruit Assembled Data Logging Shield for Arduino on Adafruit.com.